PRODUCT: 3/16 x .375 - 0.500" (3/8 - 1/2") GRIP, PLATED STEEL BODY/MANDEL, BUTTON HEAD (OPEN/DOME), BLIND POP RIVETS. 4000/BOX PRICE/BOX. High-shear strength steel/steel blind rivets are tough and reliable, and can handle vibration without loosening or falling out. 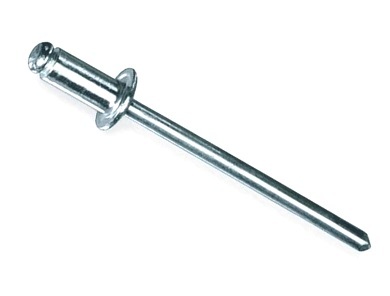 The rivet body and mandrel are steel and are zinc plated with a clear chromate coating. These rivets meet or exceed IFI 114, Grade 30 specifications.